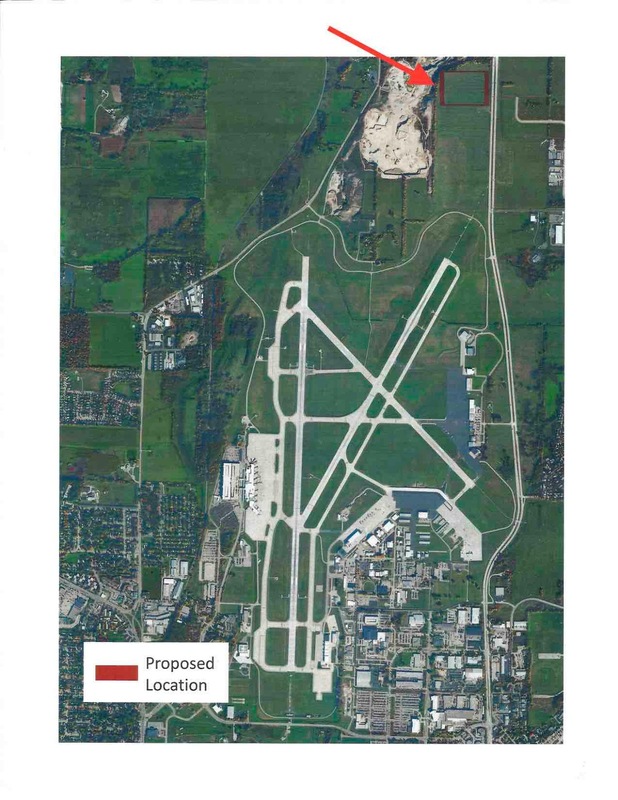 Yesterday, Dane County Executive Joe Parisi announced that the County will study the feasibility of building a 6-megawatt solar project on 30 acres at the local airport. 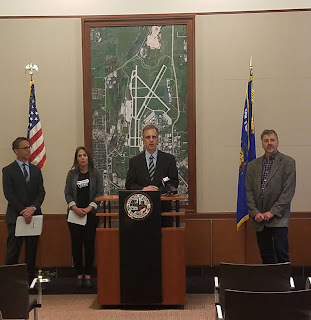 Dane County Executive Joe Parisi, at Podium, with Michael Vickerman of RENEW Wisconsin (right), Mark Redsten of Clean Wisconsin (far left), and Elizabeth Katt Reinders of the Sierra club. 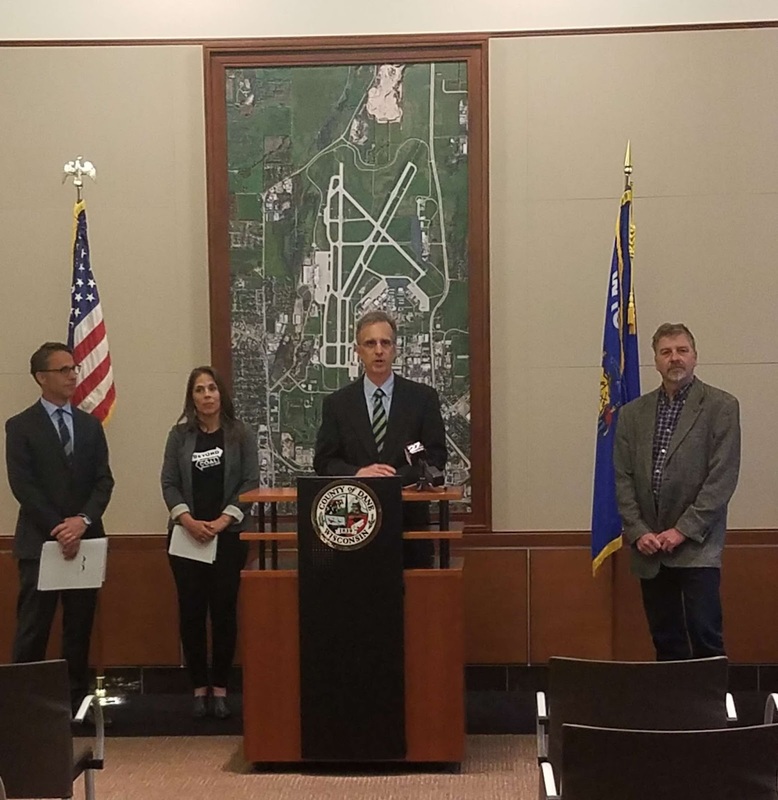 Seven months ago, County Executive Joe Parisi held a press conference to announce what was then the largest commitment by a local Wisconsin government to solar energy. This was the 770 kilowatts of solar that will serve the Alliant Energy Center and the Dane County Jobs Center, which will be installed this summer. As befitting such a milestone, he stood among local clean energy leaders and advocates, including me. Standing here today with Joe, I am experiencing a very strong sense of déjà vu, for today’s announcement surpasses the clean energy bar he set last September. When this solar project is completed, which I expect will occur in the second half of 2018, it will become not only the largest solar project in Dane County, but also in the state of Wisconsin. We have businesses right here ready to construct and interconnect more than 15,000 solar panels on airport property, and every other County resident will benefit from the improvement to local air quality and the lift to the local economy. There is a reason why so much solar energy activity is happening in our midst, and that is local leadership. We are fortunate to have political leaders in Dane County who not only recognize the value of locally produced clean energy for its citizenry, but also take all necessary and appropriate actions to integrate solar, biogas and other low-carbon resources into all facets of municipal operations. Leaders like County Executive Parisi to are grabbing the reins and plugging their communities into the 21st century energy landscape. The local of the array is on the northeast side of the airport property, as shown below.